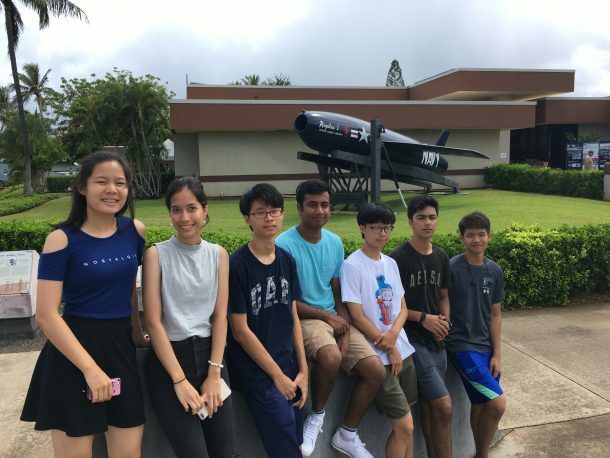 This past summer, high school students from Wells International School once again participated in the Hawai’i Summer Science Program, a joint-venture between Wells and the College of Tropical Agriculture and Human Resources (CTAHR), University of Hawai’i at Manoa (UH). 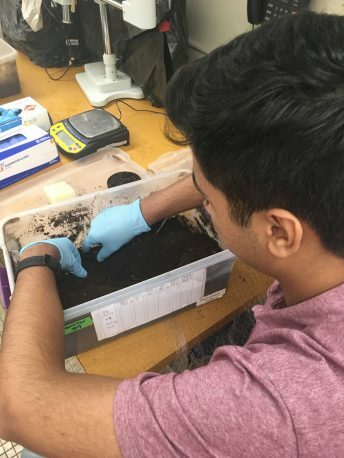 During the 6-week program, thirteen students were given a unique opportunity to work with professors and graduate students in different research labs, in various science fields ranging from entomology, virology, horticulture, bioengineering, food science and nutrition, phylogenetics and nematology. This was a wonderful chance for students to experience real-world, professional research and to develop the skills required to become a successful scientist. In addition to their work in the labs, students were also immersed in an American college-life experience, where they shared rooms with peers in the dormitory, dined at the university cafeteria and took advantage of membership in the on-campus athletic and fitness facilities. 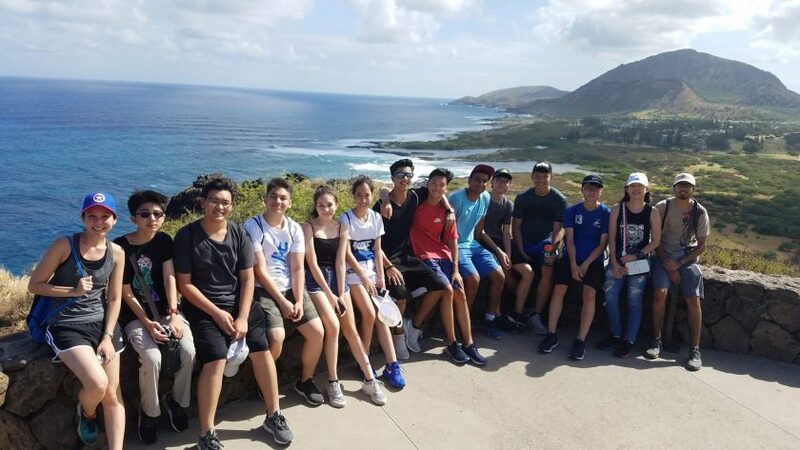 On the weekends, our chaperones organized outdoor activities, including hiking scenic trails and discovering secluded waterfalls, snorkeling, and relaxing beach trips, as well as visiting historic sites such as Pearl Harbor, Iolani Palace and the Dole Pineapple Plantation. This year marks the fifth consecutive year Wells and UH have offered this program, with over 50 student participants since 2014. Many of the program’s alumni are now pursuing degrees in the sciences and technology at some of the top universities around the world, including Caltech (Arlindo, Wells ℅ 2016), Georgia Tech (Namo, Wells ℅ 2016), New York University (Mona, Wells ℅ 2017), Hong Kong University (Sami, Wells ℅ 2017) and UC Berkeley (Puru, Wells ℅ 2018). Overall, this program has not only been opening doors into the world of science at the professional level, but also has been providing a glimpse of the often complex life skills, responsibilities and independence required of students living away from their home countries. The following are reflections from this year’s cohort as they convey their personal thoughts about their summer experience. It is safe to say that this summer science camp holds the most amazing experiences I’ve ever had. Since it was my first year attending the program, I was nervous for what was to come; for example, having to go to university and living halfway across the world from where I used to be made me quite scared. However, as soon as I arrived in Honolulu, my anxiousness was replaced by the feeling of excitement right when I saw the beautiful blue ocean. From that moment on, my views opened up and allowed me to explore fearlessly. On the weekdays, at the University of Hawai’i at Manoa, we went to our assigned labs, which was where I got to work with Dr. Sipes and one of his graduate students, Ismet Acar, in the nematology lab. Luckily, I have Zarina, a fellow classmate, who teamed up with me on this lab experience. 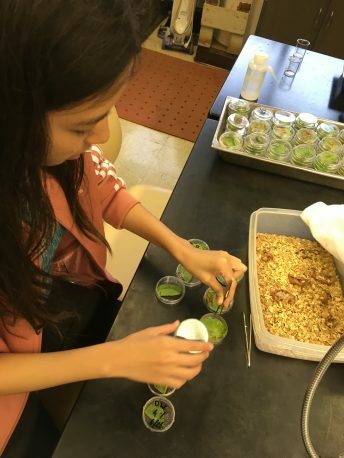 We experimented on EPNs, aka Entomopathogenic Nematodes, which are biological control agents; they help eliminate pests that harm plants and could possibly be used instead of pesticides. The aim for this lab was to find the right chemical that would protect EPNs from drying out in the sun, similarly, it is like finding the perfect sunscreen for EPNs. As for the rest of the week, we went on remarkable hikes and swims at beaches. My favorite places were the hike to Lulumahu falls, jumping off a 25-feet rock at Waimea bay, the extremely tiring Koko Head hike, and the secret beach at Kauai. All through this camp, I’ve learned to communicate more professionally with my professors, teachers, labmates, and others. This summer camp did not only expand my knowledge on the sciences, but it also helped me develop as a person. It gave all of us a good glimpse of how university life would be like and for the first time, I actually felt like I had come out of my shell. This once in a lifetime experience in Hawai’i is something I will and can never forget. 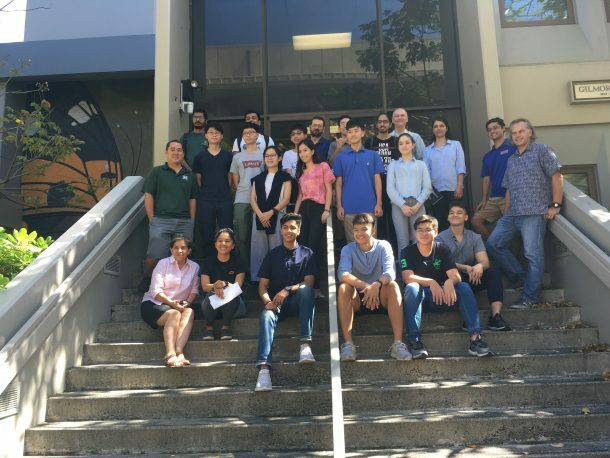 The UH Summer Science Camp is a wonderful opportunity for students to learn and go further ahead in the field of science with the provided help from professors and graduate students. This was my first year to participate in this amazing summer science camp, where I was able to live a temporary life as a university student. 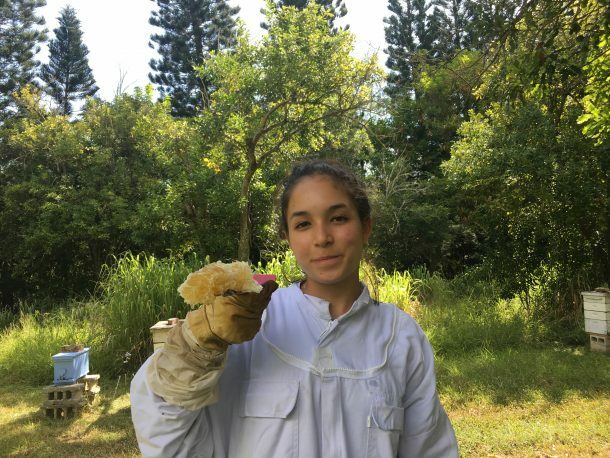 As I got off the airplane and took my very first step in Hawaii, I felt extremely excited for the upcoming 6 weeks of experience at the lab I chose, which was the UH Honey Bee Lab. It was their first time contributing to the summer science camp, therefore I was their first student from Wells to join their lab. Ever since the first day when students and professors introduced themselves to each other, I became very nervous. The factor might be because of the environment and the atmosphere of a university. However, the friendliness and kindness of people in Hawaii, especially the people in the Honey Bee Lab, made me feel at ease. I’ve learned a lot of various things in our lab, covering from the health and diet of the bees to its diseases and viruses. 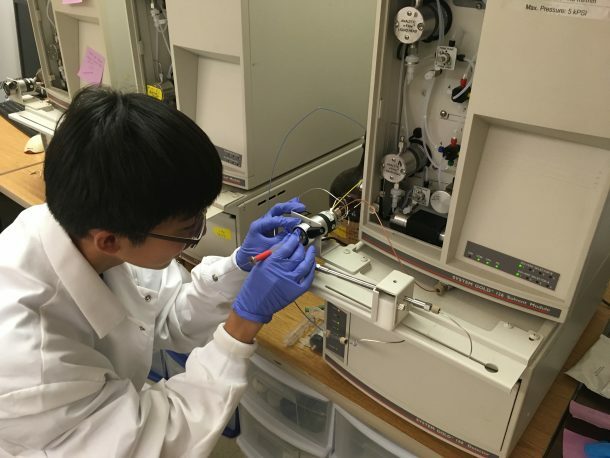 There were several graduate students in the lab that were responsible for each project. I focused and worked mostly on the bees’ health, where the graduate student (Zhening Zhou) was in charge, throughout the camp. The professor (Dr. Ethel Villalobos) and the postdoc (Scott Nikaido) in our lab introduced me to different methods in checking the bees’ health and taught me interesting facts about bees too. Due to their incredible support, I was able to learn about parasites named Nosema ceranae and Varroa mite that harm bees and solutions to save the life of the bees. One of the main things I did was counting Nosema ceranae spores under the microscope in the bees’ abdomen, which was the graduate student’s (Zhening Zhou) project. In addition, I was often invited to the lab’s field work, which was held at least once a week. The field work ranged from checking beehives in the lab’s apiaries, catching certain bees, and harvesting honey. 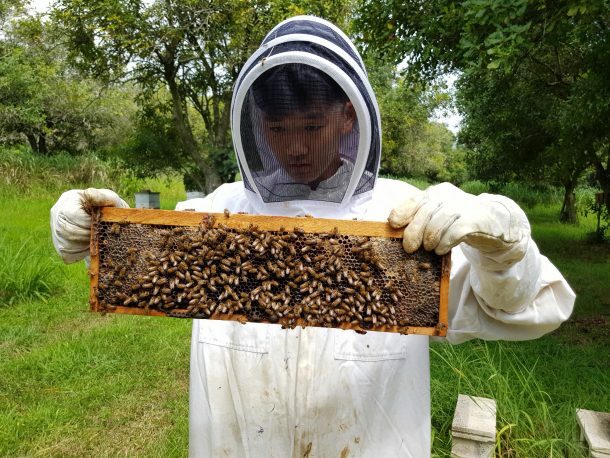 The most memorable field work was the honey harvest, since I was able to learn about the formation of honey and to harvest bottles of honey as a souvenir for attending the summer science camp. The camp included not only about science, but also numerous outdoor activities that was planned by our supervisors (Ms. Chawisa, Amber). These activities included hiking, beach activities, movies, shopping, and a lot more. 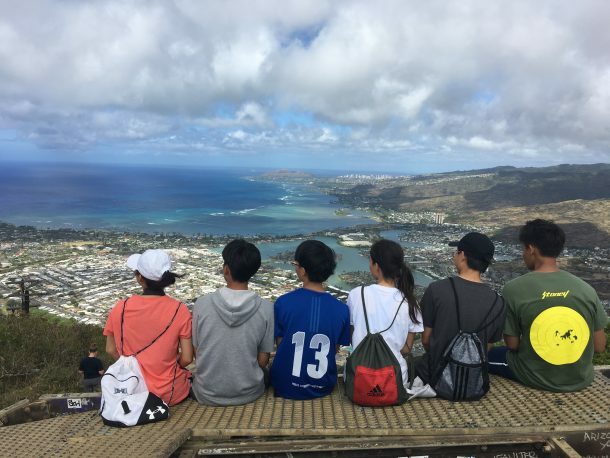 During these activities, I was able to spend memorable time with my fellow classmates, looking down at Hawaii from the top of the mountain. The view of nature and the land from the top amazed me every single time I went up hiking. It was somewhat tiring, however, the result of the hike was always remarkable. As this camp was coming to an end, I felt two different emotions. I felt delighted and great for contributing my effort to this summer science camp, but also felt depressed thinking about leaving this place forever, since I will not be seeing our lab people again most probably. Throughout the camp, I realized how different Hawaii was from Thailand, in terms of the society and the place itself. The energies that people in Hawaii put in everytime made me comfortable in talking with them. 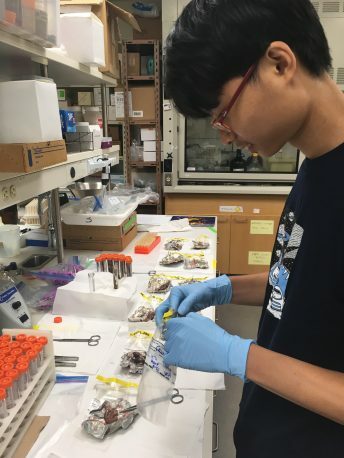 This once-in-a-lifetime program gave me an opportunity to have such great experiences during the summer thanks to everyone in the Honey Bee Lab who volunteered their precious summer time in mentoring me for 6 weeks. After all, this summer was the best I had so far during the 16 years of my life. Going to Hawaii wasn’t just another trip for me, it is an experience that I will cherish forever. Growing up as one of the triplets, this was the first time I was able to be fully independent. 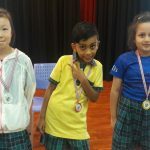 I got to not only travel to another country, but also learned how to overtake new challenges without the help of my sisters, brother, and the rest of my family. However, the main focus of the trip was on the science camp. 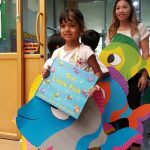 Getting exposure from real research conducted by a Ph.D. student and being able to take part in helping them was a meaningful experience for me. I worked in Dr. Brent Sipes’ lab with a friend from Wells, a graduate student, and other lab members. Our lab is about enhancing biological insect control and protecting Entomopathogenic Nematodes against UV radiation and dehydration. During the first few weeks, we spent time improving the efficiency of the EPNs functions on the aboveground applications and finding the optimal concentration of barricade, fire blocking gel. Later on throughout the trip, we continued the lab by evaluating UV chemical protectants for EPNs and demonstrated enhanced insect control with EPN protected from UV and desications. I also got a chance to use new tools such as pipet, shaking incubator, and different types of microscopes. Apart from the science aspect of the trip, there were multiple activities in which I took part. Some activities were completely new to me, for instance, snorkeling at the Hanauma Bay, going to the maze at the Dole Plantation, and going on countless hikes. Throughout the 6 weeks at the University of Hawaii at Manoa, I’ve learned 3 essential things: responsibility, time-management and communication. These 3 lessons have taught me to be a better person and I would like to thank Wells for offering me this opportunity. 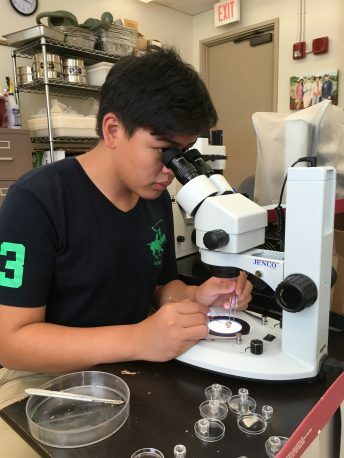 The si weeks at the Hawai’i Science camp was an exciting and eye-opening experience for me. During the six week camp, we each observed our respective professors, taking note of what they did and how they conducted each research. Each professor had a different research topic which comes with different projects that they are working on. During the time there, we were fortunate enough to be able to watch and even help out the professors with their respective projects. Through these things, personally, I was able to learn to improve upon myself by applying the knowledge that the professors have given us. While we were there, we stayed within the university dorm and got a glimpse of the life of an independent university student. We had to take care of ourselves, from waking up on time, to something as simple as doing laundry and going to lab on time. These things combined truly gave us the whole university experience. However, if there was one lesson to be taken from this lab, it is that you need to have good communication skills. Because my lab work required me to communicate with many other people both in the field and in the lab, I found that communication and planning are skills that are often overlooked. Communication was the key part in interacting with both grad students and professors from other departments that shared the same field. I also found that planning is essential to almost everything because it could mean the difference between 2-3 hours of work and a full 6-7 hours of work. If something was planned beforehand, such as making a small screen-house to keep out birds, it would take minimal effort in making a more efficient way of completing the task. I am thankful to the school, the professors at the University of Hawai’i, the grad students, and our chaperones for making this trip possible and creating this opportunity an out-of-this-world experience for us. Just coming out of multiple tough, exams, I looked at this trip to Hawaii as a vacation; and for the most part, it was. Going to many beautiful beaches, hiking up mountains all over the island. I had a great time and was really pleased with the experience. Spending seven weeks in Hawaii was a really eye-opening experience for me. This being my first time in the States, it gave me a little glimpse of what life would be like there. Additionally, I also got the chance to feel what university life would be like internationally. Getting to live like actual university students —in all of the three different dorms since we had to move around a little— it was a completely new experience for me. Having to share living space with my peers for an extended period of time was new for me; however, I got used to it within a matter of days. Not only did we get to live like university students, but the science program made us able to work like one. In my lab I got to work with Dr. Jha, the professor, and a few graduate students in the department. They were kind enough to spend their valuable time showing me around, introducing me to new equipments, policies, and many other things in the lab, which I was really thankful for, especially when most of my graduate students were extremely busy with their personal duties. The lab work itself wasn’t anything I haven’t precedingly anticipated. It was not a lot of work, but many types of work. As my professor informed us, a period of 6 weeks is too little to start an entire research project. So he decided to give me as much exposure as possible, meaning to have me aiding with the graduate student’s lab work, and using as many equipments as possible. While the professor himself will explain to me the science behind these activities. During this process I learned both how to use the actual equipments as well as the science behind these complicated instruments. We also got the chance to use the university gym which was a gratifying experience for us all, knowing that sports and fitness is a big part of university life. Overall, this trip was an experience I would never forget, and one I would reflect back upon later on. The University of Hawaii Summer Science Camp was an experience that I will never be able to forget. Not only did I get an opportunity to learn and use my scientific knowledge in a practical setting, but I also learned lifelong lessons outside of the laboratory. The drastic change in lifestyle, in my opinion, harvested such lessons. I learned to project/ share ideas, and get along effectively with classmates, and most importantly, learn to live independently. I got a chance to live the life of a college student at the age of sixteen. 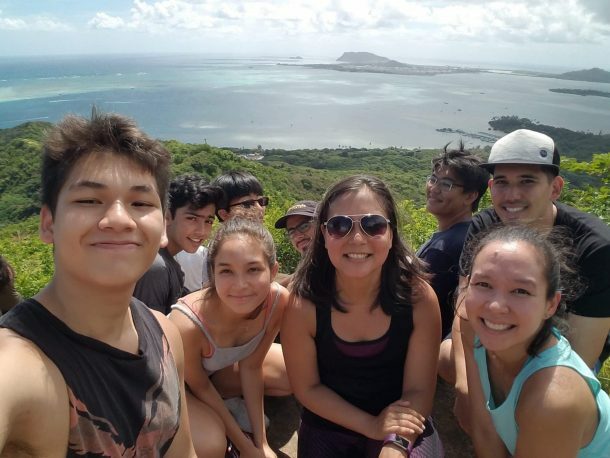 Weekend activities such as the Koko Head Hike challenged my athletic potential and helped me to develop my love for outdoor activities. The cliff diving experience at the North Shore Beach helped me conquer my fears of deep oceans and heights, and rather encouraged me to keep pushing past my comfort zones. Furthermore, my experience within the laboratory was also extremely positive. During the 2017-2018 academic year, I took up the AP Seminar class. By the end of the year, I had likely read up to 100 research papers and the question of how these research papers are made, and how the experiments themselves are conducted was almost always on my mind. 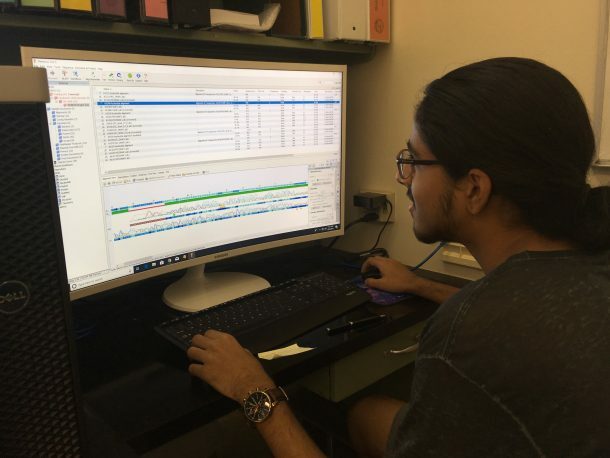 During the UH Summer Science Program, I got an opportunity to work head on with an assistant professor/ researcher to see and conduct a research myself. 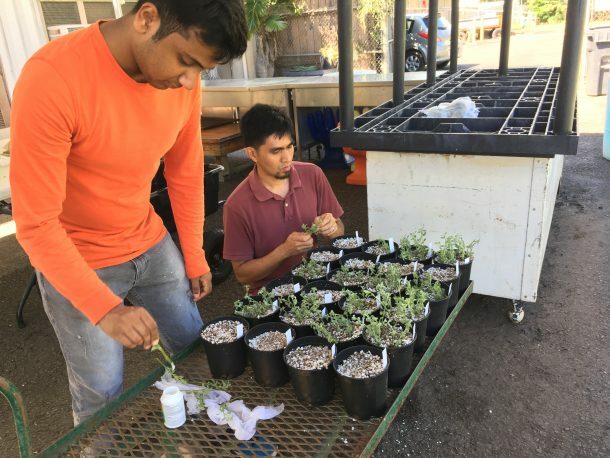 My research was based on propagating accessions of a native Hawaiian plant Melanthera Integrifolia (Nehe). I got an opportunity to design, conduct, collect data, and make a professional poster for my research. To conclude, the experience I gained at the UH Summer Science Camp is an experience that I am very grateful for. Imagine that you are a person who has been living a relatively simple life, with groups of people accompanying you in everything you do in your daily routine. Then for a moment, imagine that you are put in a completely different environment, where you must do every single task by yourself with no one there to help you like before. It would honestly require massive amounts of change for you to be able to adapt to the new environment comfortably. Similarly, from the 2018 Hawaii Summer Science Camp, I had been through an almost exact experience to what I have previously mentioned but in a lower degree. It was on the first few days of the first week when I started to realize that living in the dorm here differed from my life back home in Thailand, as it required greater amount of discipline and responsibilities in every single day to achieve the daily tasks that were being set for us, and I knew exactly that this is what college life will be like. From then, I kept on progressing myself to perform well within the set of rules that were set and gradually learned to be more used to living in the dorm. Beside this, I have acquired so much more knowledge and experience from my professor, graduate, and master students from the Department of Entomology at UH. Moreover, there was one main experiment that I was working on, which is about using “Entomopathogenic nematodes” as a useful biological agent to control pests. This experiment taught me how to use tools effectively in acquiring data samples for analysis, it taught me how to perform a “white trap”, which is a way of collecting the nematodes samples, and many more. Besides this, I was able to be involved in helping my master student to conduct his experiment by accompanying him to different locations to collect data such as collecting a branch of trees for an analysis on the quality of the tree, which are being collected in a table to observe and see the trend of the tree’s health monthly in relation to the chemicals that were injected into each particular tree. As time passed by, I was able to exchange ideas and progressively learned something new by communicating more frequently with my graduate and master student which was one of the best experiences I have had so far. 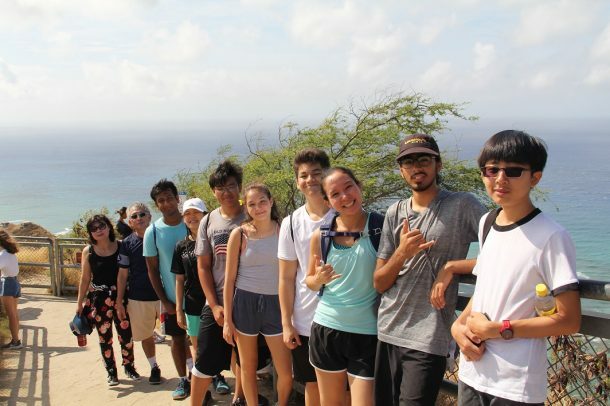 Furthermore, this camp allowed me to not only be engaged to the university life of a student, but I was also able to be exposed to the culture and to the different activities here in Hawaii. I really enjoyed going to different beautiful beaches and hiking trails where stunning views of the island can be seen. I have had so many memories from this camp with new people I met, the dorm life there, the beautiful beaches, and many more. Lastly, I would like to thank Wells for giving me this wonderful and breathtaking experience and I really appreciate how this camp provided balance to me by bringing me to experience different kinds of activities every week which makes this one and a half month long camp especially worth it to me. Those six weeks in Hawaii weren’t just the most enjoyable weeks on a school-directed trip but perhaps the most informative. It provided you with insight to all the nitty gritties of college life: the intense work, independence, and tremendous responsibility. I worked in Dr. Melzer’s lab where I worked in plant pathology, tissue culturing, and the farming of Coconut Rhinoceros Beetles. My research duties in this lab consisted largely of diagnostic work, where I’d test different tissue samples for plant viruses like citrus tristeza virus or gemini virus. In addition, some days, I would tissue culture taro or sweet potato. Lastly, every Tuesday morning, I would work in a quarantine room raising colonies of Coconut Rhinoceros Beetles for research purposes, since they’re an invasive species in Hawaii. In the process of all this research, I worked with my professor Dr. Melzer, 2 post-doctoral researchers, 2 graduate students, and an undergraduate student. Hence, I attained the ability to communicate with a wide-range of academics, in order to fulfill my research duties in the lab. The main takeaway I had from my experience at Hawaii is that you’re going to make mistakes. A lot of them. However, these mistakes were invaluable to my experience as it allowed me to really understand and be capable of performing my lab duties. Sometimes it would be small mistakes like remembering to eject the tip of the pipette before doing anything else to avoid cross-contamination, or larger mistakes like not introducing any nucleic acids in a PCR cabinet to once again avoid contamination. These mistakes didn’t just help me fully understand the processes I had to undergo, but it also allowed for my professor and graduate students to trust me to work independently because after going through the initial mistakes with them, I wouldn’t repeat those mistakes. So in the end, I didn’t just attain insight into life at college, but I learnt to become more responsible and independent all the while being able to handle the intensity of the work. My experience this summer in Hawaii was anything but dull. Being involved in 3 different research projects, I definitely learned a great deal. 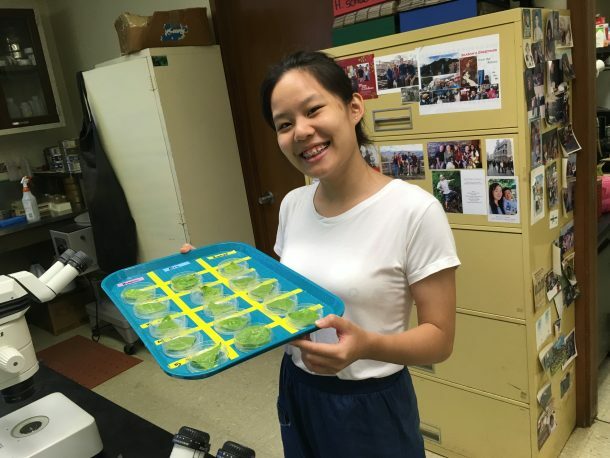 My graduate student, Jessie Kai, was conducting research on the basis of finding the nutritional habits of Native Hawaiian mothers during the first months of feeding for their infants. This data will be used to compare feeding practices of ethnic minorities on the island, in comparison to ethnic minorities in the mainland – who have a different cultural background completely. In this project, I learned how to conduct surveys and interviews that require appropriate social skills. The second project I worked on was also in the field of nutrition. Conducting academic research with a doctorate student and former professor from Brazil, Vanessa, I learned how to effectively gather information from published studies. We also investigated nutrigenomics, and how psychology as well as economy can affect nutrition. My third and final project was completely different to the first two, as it was a lab that collected data from bees in the field. In this project, I learned to be careful when handling live samples, and that every life is precious. Most importantly however, I also learned that I am in fact, not allergic to bee stings. This was the second time I had been given the opportunity to participate at the summer science camp and I would like to say that it gets even better. I loved everything about the trip last year which made me eager of my return and it did not disappoint. I was given the opportunity to work with a number of distinguished professors and graduate students to really experience the application of everything we study in the sciences and have a glimpse into our futures as many of us want to pursue careers in fields like these. Not only do we get to exposed to the research scene but we also learn about a university lifestyle. A way to experience independence that we carry throughout the rest of our lives. A place where we create bonds with new faces and experience a new environment all together. This allows us to look forward to something as we go through our final years at school. I have gained so much from the trip that I cannot begin to explain all the little details and incidents that occurred that really made it special. In the lab itself I was given the opportunity to work on my own project and do actual science. I was able to contribute to multiple papers and projects taken up by people around me and really feel proud of the work I had done. This had given me an insight of what it was like to work in a lab, do research and really dedicate your time into something that you love doing. Overall, it was a great learning experience for I made so many new connections and just had a good time with a lot of friends in Hawaii. My second year in Hawai’i was a gratifying experience. It was great seeing familiar faces in Dr. Muzynski’s lab again. Although I worked with the same research team as last year, I definitely learned new things, both inside the lab and beyond it. I continued my work on maize genetics from last year. In addition to that, I was given a new independent project concerning the annotation of a maize mutator. In the lab this year, I learned to be my own research team, as I created and conducted my own experiments independently. In addition to last year’s experiences, I learned several things through our activities and lab works. This year I had the chance to explore Oahu even more. We went to 5 hikes and 4 beaches. It was certainly refreshing to be surrounded by nature. As I was taking in the breathtaking views, I realize how lucky I was to have the opportunity to be there. 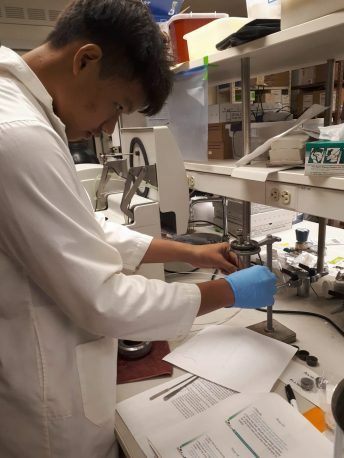 Through my lab works, I learned to work independently and skillfully. While applying my knowledge in several fields including biology, math, and chemistry, I realized that although I may be working in one specific field, applying other disciplines such as math and chemistry allows me to come up with a better, more holistic solution to my experimental problems. This lesson can be applied to all life situations as one solution may not appear in one specific field but rather in different approaches. Since this trip was my last year to be there, I learned to appreciate what I have and not take it for granted. It has been the most amazing and beneficial science camp of my life. I definitely have grown more mature, more attentive and more confident than last year. I have also become more independent, more appreciative, and most importantly, a better person. The past 2 months at Hawaii had been an enjoyable trip, full of great experiences and memories that I would treasure forever. Traveling for 2 months and collaborating with graduate and PhD students at the University of Hawaii was surely a meaningful opportunity. At first, it was a little hard for me to be comfortable working with them, but throughout the camp I learned to communicate with them more effectively. I was really lucky to be able to be part of Dr. Jha’s Animal Nutritional lab in Hawaii. I mainly worked with one grad student on his research on the feedstuff for chickens, basically to determine how different components of food fed to the chickens will affect their growth while maintaining the cost of the feed. His research can be applied to the food industry as this research can contribute to improvement and efficiency of chickens’ growth. In addition, this research can also be used as a comparison to the human large intestine. As chickens have 2 secum in their large intestine but humans have only 1. However, both of their jobs are to ferment the left over food, as there are mycobacterial in the large intestine of both chickens and humans. Adding on, my job in the lab was to squeeze out the ferments in the chickens’ secums and centrifuge it, separating the samples with different feeds for chicken. Then, we later on checked the percentages of different nutrients using the GC vile. From this camp, I’ve learned to handle a pipette and learned different uses of different tools and this knowledge will be with me for the rest of my life. 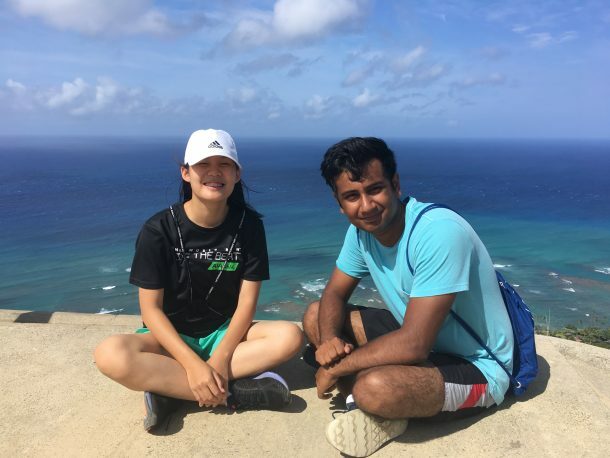 Although the main purpose of being in Hawaii was mainly for the science program, we still had chances to enjoy Hawaii’s vibe through activities such as hiking and enjoying the views of Hawaii’s landscape to bathing in the seawater there. 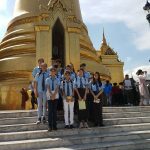 Getting the exposure of the world outside of Thailand helped me develop as a person in various ways, for instance I’ve learned to be more punctual and confident. After the camp, I’ve learned that being on time is very crucial in college because it reflects who you are to others and that is why I’m trying to be more punctual as a person now. Another crucial skill I’ve developed over the month was self confidence as working with professors and grad students require us to interact with them, and to be able to do so we have to be able to communicate with them effectively. And these 2 skills will be with me for the rest of my life and I would like to thank this experience. 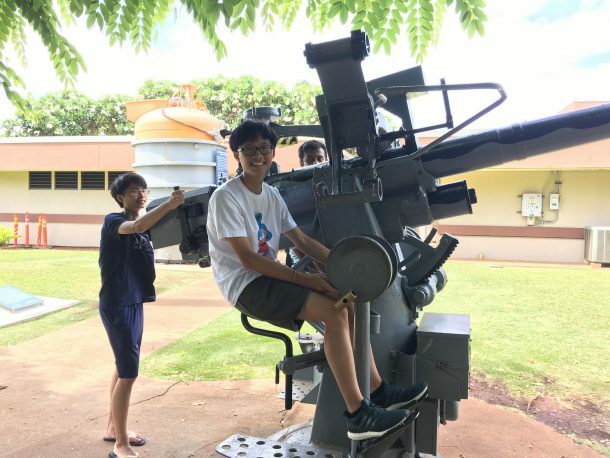 After participating in the Hawaii Summer Camp for the second time, I can gladly express that my expectations from the previous years have not only been met, but were also far exceeded. This can mostly be credited to how all the desirable aspects of the camp from last year retained, while also being added onto or enhanced by other factors. Working in the lab was a great pleasure as I once again got to experience not just the work of a scientist, but that of a scientist’s lifestyle as well. I was pleased to see that several identifiable routines from last year were maintained, which includes the emphasis on proper procedures such as the placement of compounds, tools, and even food, the usage of labels consistently, and other non-experimental practices such as retrieving mail or even discussing personal interests. This year also allowed me to interact with two other members to which I had minimal or contact with previously, which greatly enhanced the sense of community that I have enjoyed before. Perhaps the biggest takeaway as opposed to last year however, is that I learned the importance of failure. As of this year, the members of the lab entrust me to perform more tasks in both the greenhouse and as aid to their experiments, in which I would encounter issues in my methodology, lack of understanding and need to perform even simple actions repeatedly for acceptable results. This helped me further understand that within science, failure and setbacks are frequent and are usually part of the process in discovery or self-improvement. As such, I cannot thank all the members of the laboratory for their endless amounts of patience and faith in allowing me to handle some of their work. The importance of self-induced balance is once again prevalent in the camp outside of the lab, as students were expected to handle their own diet, fitness hours, and leisure with only some supervision. This aspect allowed the camp to not only be one of learning about science, but that of training how to live outside of what we are used to as well. This year also had a surprisingly large amount of locations and activities that were done during the weekends, which is something I can’t be thankful enough as there were many unforgettable experiences on the beach, mountain, nature reserves, arcade, zoo, and shopping areas. I can say without a doubt that everyone, being the professor, the lab members, the supervisor as well as the other camp members and residents of Hawaii went above and beyond to create one of the most meaningful and memorable experiences I have had so far.